Pinnacle Landscaping offers Full Landscaping Services including Design and layout to mulch, stone, pond installations and lighting. Hardscaping including patios, steps and Retaining Walls. We offer quality "A" Grade perennials, trees and shrubs. Spring and Fall clean-ups and Leaf Removal. 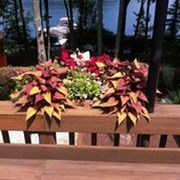 Custom Annual Flower Planters in the Spring. Decks and Docks. Snow Plowing. Rate and review Pinnacle Landscaping in Moscow, PA, United States! Share your experiences at Pinnacle Landscaping with your friends or discover more Public Transportation in Moscow, PA, United States.